The reaction from the press has been overwhelming. 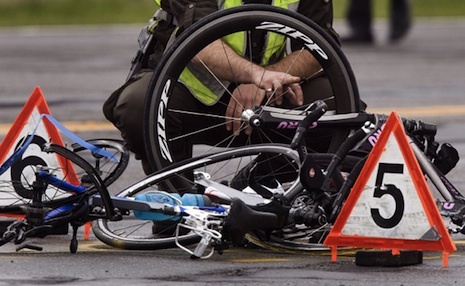 Stories have been springing up everywhere about cyclists’ safety and the need for reform, but as usual it takes a famous person to get hurt before the government, the media and the people stand up and take action. These accidents are happening too often and too many people are getting killed. The Royal Society for the Prevention of Accidents’ figures show that 19,215 cyclists were either killed or injured on the road in 2011. Perhaps surprisingly, the figures also show that over 80 per cent of cycle accidents happen in daylight. 75 per cent happen at or near a road junction. This makes some of the advice given to cyclists regarding light-reflecting clothing not irrelevent, but due with caution. The government’s scheme for children and parents called ‘Bikebility’ is a step in the right direction, promoting cycle safety and discussing biking issues. Figures from Transport Scotland disclose that there was a 13 per cent jump in the number of cyclists suffering serious injuries in 2011 when compared with 2010. The crux of the problem is the legal system’s lenient approach on sentencing for motorists at fault in accidents with cyclists. People’s mindset needs to change. Awareness is a word too often thrown around but here it must be pushed upon the world. Next Post I shall climb Ben Nevis.